Why is this duck smiling? Because he has a little secret. 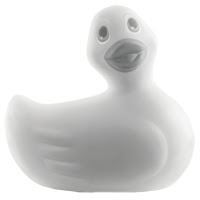 The Jimmyjane Iconic Duckie is not only a waterproof, floating (lopsidedly, admittedly) rubber ducky pal for your tub… he is also endowed with a pretty substantial vibrating motor. You know, to make bathtime lots of fun! Part of the Usual Suspects collection from Jimmyjane, the Iconic Duckie is a stunning monochromatic version of the classic yellow I Rub My Duckie vibe. Boxed as shown above, the Jimmyjane Iconic Duckie is perfect for shower gifts (bridal and baby– mama needs some "me" time, too!) and personal hygiene afficionados. Disclosure: I received a Jimmyjane Iconic Duckie for review purposes. No, I don't have to send it back. Ick!